Citizens of Ukraine have registered the most companies in Estonia using the e-residency system – 423 companies, the head of the Tallin office of Ilyashev and Partners Vitaliy Halytskykh has said. “Ukrainians top registrations – 423 companies, while 2,131 Ukrainian citizens have received e-residency cards. Next comes Finland – 315, Germany – 311. Demand is growing,” he said in an interview to the Kyiv-based Interfax-Ukraine news agency. Some 3,444 companies have been registered using the e-residency card, while in November 2017 the number was 3,000. 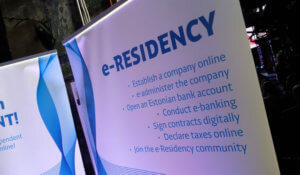 “The e-residency card does not offer tax residency or the right to visit Estonia, but allows the use of all government services, including registering companies online, online banking, signing contracts electronically, serving motions online, et cetera – about 99% of all state services can be used online, and e-Residency in Estonia makes them internationally available. This has attracted Ukrainian business,” Halytskykh said.